Anna is the model citizen. The 31-year-old self-described professional volunteer spends Mondays running a free bike workshop, Wednesdays counselling others in the community, and in her spare time is helping to build a community garden in Camberwell, South London. Among her projects: Free computing workshops, a shop set up to help young mothers who cannot afford their kids’ back-to-school clothes, free skill-share workshops. People like Anna are helping to make David Cameron’s Big Society “vision” a reality. From free judo lessons to building adventure playgrounds or residents uniting to protect their libraries from the threat of closure, across London communities are uniting to help one another. Just one thing… all these programmes are run by anarchist groups. But when he set out his vision he probably didn’t have anarchists in mind. Dr Jo Haynes, a sociologist from Bristol University says the comparison is telling. “It’s interesting that theoretically, a smaller state – or no state – chimes with anarchist principles as well, but the power taken by the people through anarchist community activity and political mobilisation would be at odds with the kind of ‘soft power’ envisaged within David Cameron’s Big Society idea”. Jesse Norman disagrees. The Conservative MP, who has written a book on the Big Society, says while anarchists would be “absolutely appalled” to be considered at the vanguard of an idea which originated from the Conservative party, the two are are not so dissimilar. Dr David Chapman, a research analyst at the consultancy Monitor Group currently researching social entrepreneurs, believes Conservative advocates of the Big Society should look to anarchist groups. “To my mind an anarchist group in Dalston creating a community garden is exactly the same as some middle class parents in Oxfordshire trying to provide a free school. It’s the community coming together. But Dr Chapman says for the Big Society to work, everyone has to feel empowered. And what do the anarchists think? Andy Meinke, Secretary of London-wide anarchist collective ALARM is scathing about the Big Society but recognises the comparison: “Obviously we regard Cameron’s Big Society as an attempt to do social services on the cheap. The reality of the big society is creating a society that’s not run for profit but for human need. Some are slightly more forthcoming: A community scheme for the unemployed in deal with the government all the time: “We are looking at people being moved from DSA [Disability Support Allowance] to JSA [Job Seekers’ Allowance]”, says trade union activist Marie “we want to help people”. As for Anna, she runs most of the skills workshops from the communal squat she lives in – an activity the government is currently consulting on making illegal. “We’re organising over 30 workshops and it’s all free skill share. Welding, plumbing, electricity. Alarmingly there is quickly emerging a rather warped consensus on what [the NPPF means] for rural England (in terms of the landscape) and what they mean for English culture generally, and my own concern lies not with who is getting pushed into a corner, but those that are crawling out of them as the debate hots up. … one of the many methodologies being utilised by campaigners to rally the troops is the invoking of iconic ‘symbols of Englishness’ but some of the notions currently being peddled are not at all helpful and, in certain cases, highly dubious. The establishment of Green Belts, with all-party support, had produced what Peter Hall long ago called a ‘civilised form of apartheid.’ The rich can buy their way into the Green Belt; the commuting middle classes can leapfrog it into new settlements and old country towns and villages beyond it. ‘How lovely to own a house in an area – town edge, village or green belt – where competition had been removed. Most of the good people who appear at public enquiries to object to development do not, I think realize that they are supporting gross and unprincipled greed. The Dale Farm Travellers know a thing or two about what happens when a concept of underclass is used in tandem with spurious notions of what does or does not constitute Green Belt land, and as Colin Ward knew well enough, if you have a society in which the greed of one social and/or political class can dominate policy in the rural sphere while in the urban you have children who have never seen woodland or a stream, let alone lived among living creatures other than human beings, there is little hope for our society to become whole and at peace with itself, and the divisions will merely grow wider as greed becomes the norm…. when papers such as the Guardian, traditionally a champion of social justice, run stories on the NPPF that neglect the plight of the rural poor, you know the battle is half lost already …The only problem is, when the Conservative Party starts messing with everything Middle-England holds dear, the only route they’ll accept at present appears to be a shift further to the Right. Certainly provocative. Certainly one extreme right plaingenetic fringe has got involved on the anti-NPPF side, but also so has one far ight neo-liberal pro-tea party fring on the pro-NPPF side. Things are complicated and both sides need to watch out for extremists and look for ways of seeing the other sides point of view. One of the best ways of doing this is for the NT and CPRE to avoid being cast into a BANANA Berbour Brigade stereotype and support a broader progressive ‘Campaign against Sprawl’ that presses for more affordable housing in the right place. I’ve covered some of the influences on conservative thinking on planning over the last couple of months – whether the Simon Jenkins little platoons view of localism, or the influence of some quite extreme right wing american groups with a voraciously anti planning and anti-environmental agenda, as well as there influence within number 10 itself. One key player and text I have omitted previously is Ferdinand Mount. He was the former head of the number 10 policy unit and writer of the 1983 election manifesto. According to Conservative Home his 2004 book ‘Mind the Gap’ was considerably influential in the formation of conservative policy. The basic thrust of the book is simple, the greatest failure of Thatcherism was the widening gap between the haves and the have nots. The book clearly shows the influence of the great anarchist sociologist Richard Sennett in his book ‘Respect: The Formation of Character in an Age of Inequality‘, though seem rather off conclusions were taken from it. Sennett had argued how the powerless in a non-egalitarian yet meritocratic society, could win back a modicum of self-respect. His book stressed self-sufficiency, not being a burden to others, and, most importantly, mutuality, helping others and contributing to society, without which the self-sufficient person would inspire only limited respect. It is a key text in the literature of what I have termed ‘actually existing anarchism’ those writings about existing power relations and how to manage them, rather than an overt desire to abolish the state through force. Mount though has a very nostalgic view of this. Like the Red Tories & Blue Labour Mount is highly nostalgic for working class institutions, rituals, and group loyalties. He seeks to overcome the segregation of rich and poor in housing ghettos by creating a property owning democracy, but one where the poor would have access to the countryside. Now three-quarters of the population own their own homes, the whole culture revolves around that self-defining possession of a plot of land and four walls. Those without are more dispossessed than ever. It is time to make ownership possible for all…. The shortage of affordable housing, especially in the south, is due to the astronomic price of land. Forty per cent of the cost of a new house in the south-east is the price of the land. The value of land is due directly to strict planning laws. Fewer houses are being built now than for decades, while agricultural land – no longer of dig-for-Britain economic use – is senselessly protected by middle-class lobbies. But it’s time to let land go, send the price of housing tumbling and make everyone a property owner. Mount accepts that setting people free to build will mean more eyesores and landscape blots, as people are allowed to build in ramshackle ways. But if it would transform the lives of all the dispossessed, giving them a real stake, responsibility and a share in wealth, isn’t it worth it? The Campaign to Protect Rural England would say no – but here’s a conservative willing to argue against a landscape frozen in time by the 1947 Town and Country Planning Act. Mount is right to argue that ownership outright is a cause of class divides. Ironically now, as David ‘two brains’ Willets has rightly realised it means a net transfer of income from debtors to creditors between generations – or of older people who rode the property owning baby boom exploiting younger people trying to get on the housing ladder now – unless they transfer some of that wealth. (19th century radicals I think would have been shocked by the thought of a generational source of landowning class divide – of children having a net transfer of wealth through land rent to their parents generation). But in arguing for a laissez-faire approach the only people enriched would be country landowners, and housebuilders, as very little of the uplift in land value would be transferred to buyers, and even then those buying are those able to afford low or no mortgages, those with existing capital. A typical Tory approach pretending to help the poor but actually enhancing rentier unearned income. Only truly radical policies, of giving a basic income funded by the unearned increment of land value uplifts, aimed at breaking up large concentrations of landed property, can overcome this. It is also incredible to think that local areas whose politics revolve around p[reserving and enhancing house prices will vote for extra housing whose purpose is to lower it. The whole idea, like all of the conservative planning reforms, are founded on an impossible contradiction. It does lead to an interesting though experiment though. Think of the 260,000 extra houses needed over the next 20 years. Imagine that all of the 80,000 off English villages were sent names of the 60 houses each of newly forming households they had to allocate land for. They could either buy them off or buy extra land elsewhere to transfer the plots to. This would of course lead to a massive transfer of wealth. Behind all of the rhetoric of ‘imposed’ targets lies true interest – the interests of Daily Express readers who used to check daily how much the value of their homes had risen. The neglectful treatment of public space, with piles of garbage on every corner, has been a sad fact of life in Russia. Russia’s thrird most popular blogger Sergy Dolya has had enough. he created the movement “Bloggers against Garbage.” The idea behind the movement is simple: local bloggers choose a heavily littered place near them, then use social networks to rally as many people as possible for a collective cleanup. The movement initially counted just several dozen participants, but has grown exponentially to reach several thousand members across the country. Its most ambitious goal yet: a nationwide litter cleanup day planned on August 6. The idea works: I expect some 20,000 to 30,000 people to take part in the August 6 nationwide cleanup day. There are cleanup actions planned in over 100 cities and towns, and in 80 places in Moscow alone. We’re also pushing for the implementation of a long-overdue national waste recycling program, which exists in every developed country except Russia. Some local authorities have begun to take interest in the project. I know the governor of Astrakhan, who’s an active blogger as well. I called him to tell him about the August 6 cleanup plan and said that we would use some help. He was very enthusiastic, and sent a letter to his fellow governors asking them to participate in the movement. I hope we’ll get some financial or material aid. We have been looking at the causal relationships in the establishment and reproduction of social systems. We will turn next to the establishment of the formal ‘economy’ as we know it, as well as to the establishment of cities, property and structures of hierarchy/the State. In adopting a cultural ecology perspective we can show how social systems endure through a successful, if often temporary, adaptation to the resource challenges they face. Clearly causality implies a determinism, an outcome of an objective reality. This kind of determinism is not a crude materialism, especially of the economist turn where all actions are traced to economic causes or ‘laws’. The very existence of the economic itself, of economic relations is an emergent phenomenon, emerging from the interaction and mutual determination of several social systems, of gifting, receiving, exchanging, producing, trading; each of these sub-systems coming about because of their ability to help create, sustain and manage a social surplus – a breathing space over and above raw subsistence and survival, a breathing space in which society can form, in which production is possible and travel and trade is practicable. These mechanisms of causality are multiple and complex, which as Warren Weaver taught us makes systems hard to predict fully. 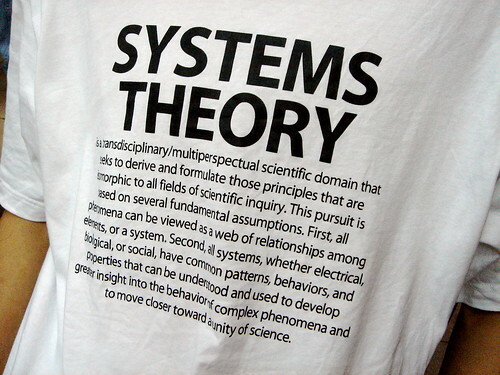 Today we tend often to refer to complexity theory as a synonym for systems theory, the theory of complex relations. But by complex we do not mean random, chaotic or unknowable. A sub-system is a boundary between a system of regulation and control and the unregulated and uncontrollable beyond. Indeed all spatially bounded subsystems – which include all social systems – come about because of the need to define and control a locality within which knowledge and power are possible. A ‘here’ a home space and a ‘there’ an other-space beyond. By systems materialism I mean an approach to studying the causality of social change which focuses on the physical aspects of the transformation and transportation of matter and the energy required to do so, as well as the reality of ideas on how to do so, as they are able to influence real physical events. A systems approach recognises the multiple and intersecting causalities, and the systems of feedback which exacerbate change or slow it. A systems approach also provides a conceptual approach which is applicable at all historical, and proto-historical, times; rather than an approach applicable only to modern capitalism then retrofitted, crudely, to other times and circumstances. A systems approach is needed because reality is systemic. It is the way the world is. We can create a systems model as a reflection of reality, and that reflection is likely to be easiest to model for the simplest and most self contained aspects of reality. As Dominique Chu writes the radical openness of systems mean that any model we create will always be an approximation of where the boundaries of where a sub-system lie will will depend on the context of outside influences. Our models will be wrong but the act of model building can give us a greater understanding of reality. This approach is similar to Roy Bhaskars early ideas on Critical Realism, that reality has depth, and it is worth probing to discover it. A systems materialism is also materialistic because its focus on ecology as ontology. There is not an infinite possible number of ideas that can be transformed into reality and where that reality sticks. Reality only sticks, ideas stick, when they can create sub-systems that reproduce in terms of there mechanisms for managing flows of energy, regulating their environment and securing an evolutionary trajectory. Ideas not a mere cipher of matter. To be read off a material ‘base’. Ideas are structures of information, information on how to approach reality and how to approach other ideas. Different ideas will have different information content on how to shape reality, each with a different information productivity in terms of the efficiency of the use of energy and the processing of matter. Ideas co-evolve with the environment and other ideas. Succesful ideas are those that change the world. In searching for a materialism that avoids the abyss of dualism we have to turn towards some of the ideas of Joseph Dietzgen – of his conception that thought is material, or as he put it “Nature comprises all” . “Our perceptive faculty is not a supernatural source of truth, but a mirror-like instrument, which reflects the things of the world, or nature” Thought and matter were no longer radically. Dietzen was a libertarian socialist thinker that sought to bridge the deepening gap between ‘anarchist’ and ‘socialist’ camps after the first international. His classic work is The Nature of Human Brain Work: An Introduction to Dialectics (1869). It was he and not Marx who invented the concept of ‘dailectical materialism’ and Marx was greatly influenced by his ideas. However as can be seen his concept of materialism was very different from that of Marx who characterised ideas as a surface effect, a superstructure, built on a material base. Dietzgen broke with this old fashioned kantian dualism. The world of reality is a never-ending, always changing set of observable phenomena, and it exists only as a united whole – nature. Today we see Dietzgen only through second hand sources, though was was critical, but deeply influenced by him, and through Lenin who thought his ideas ‘obviously false’ . The kind of ideas that Dietzgen criticised were those of the vulgar materialists who believed there was a one way direction of causality from physics and chemistry to ideas and to political change’. Lenin was so fierce in his criticisms because it was precisely this kind of materialism he defended. Pannekoek criticised this kind of materialism as the ideology of a new working class, a party of technocrats that had adopted the ideology of shopfloor capitalism and scientific management. We can reject this reductionist historical materialism- an artefact of enlightenment ideas of a prime mover, unidirectional causality as a substitute for God. The limitations of a theory of history extended to be a theory of society and a theory of ideas was well known to Engels. But what was the relationship between the primum agens and ‘secondary’ factors? How do ideas come about and influence social change. This gap in Marxian analysis led to various theories and ideas of social agency from Weber to Parsons. But the necessary corrective of focussing on choice and agency did and can lead to the neglect of structures and tendencies that bring about chance irrespective of the choice of the individual. Those features Adam Smith called ‘The Invisible Hand’. Marx as a close reader of classical economics would have been closely influenced by the idea of the ‘long run’ – from Ricardo in particular. A tendency over a period of time for various economic laws to bring about an inevitable outcome, irrespective of short term fluctuations. There are many such dynamic tendencies in classical economics. Capital will flow from areas of high profit to low profit, from countries with low potential for profit to those with high. Processes with low profits will be abandoned, as will stocks and currencies if they offer poor returns. This is often forgotten and ignored. Political economy appeared to show the primacy of economics in a fully monetary economy – capitalism – a society where everything could be bought and sole. If everything could be bought and sold then in the ‘long run’ economics appeared to explain everything of social significance. If the economy and society – political economy – is seen from a systems perspective, and one where ideas shape reality through providing information and ideology to guide behaviour, we can formulate an approach to theory of historic change that can embrace, and manage, complexity. It can explain the link between the individual economic decision and change in whole economy through systems concepts such as homeostasis, systems of adjustments in crowds (we will explore this issue further later). It can also make use of a broader range of tools than historical materialism available from systems thinking, of self-organisation, of telenomy, of emergence (we shall also go through these concepts shortly). These tools through adopting a systems approach can explain, as Marxian concepts cannot, of how social/economic systems are part of a wider ecosystem on which its fragily depends. These tool are capable, in the way reductive historical materialism is not, of developing coherent theories where power, social control, ideology can be explained and seen to determine social systems, as it is the very creation of simple social sub-systems that makes control of that sub-system possible. For example it is hard to rule the world, but easier to control an isolated village of believers. At this stage it is useful to examine Rudolf Rocker’s anarchist theory of history. We do not deny that in history, also, there are inner connections which, even as in nature, can be traced to cause and effect. But in social events it is always a matter of a causality of human aims and ends, in nature always of a causality of physical necessity. …In the realm of physical events only the must counts. In the realm of belief there is only probability: It may be so, but it does not have to be so. Every process which arises from our physical being and is related to it, is an event which lies outside of our volition. Every social process, however, arises from human intentions and human goal setting and occurs within the limits of our volition. Consequently, it is not subject to the concept of natural necessity…. We are with Rocker’s critique of historical materialism here, but with one critical provisio. ‘The realm of probability’ will create potentialities for social action, but only those ideas that can be enacted through a system of power will be enacted, and in the long run only those increase the survivability of social systems, through the evolution of increased economic efficiency, will survive to transmit those ideas. Through understanding these systemic materialist connections we can avoid the new age missapplication of systems ideas, the trap that because everything connected to everything, we need explain the causes of nothing. Holism, and the relationship of the part to the whole is critical in systems thinking. These ideas were often glimpsed in partial form in earlier thinking before modern systems thinking developed, these ideas we tend to bundle under the term ‘dialectics’. Systems ideas enables us to strip away the metaphysical and idealistic crud of Hegalism that contaminated this brand. Today we are at an end of an age of failed ideologies, of monopoly capitalism , state capitalism and marxism. As we said failed ideologies will struggle to survive and be transmitted if more robust ideas are developed. Minsk has hit back by banning applause in public. With the country due to celebrate Independence Day on July 3, it means that clapping on the streets could see people clapped in metaphorical irons. But there is a serious side to the government’s proposals: opposition groups have been staging slogan-free demonstrations where participants merely stand and cheer, rather than yelling their demands. The police promise to allow applause on the street at July 3 celebrations, but only if it is directed at acting servicemen and veterans, deputy head of Minsk police Igor Yevseyev said at a press conference. “If it is applause for our veterans or servicemen – then of course, it is allowed,” he is quoted by Interfax. Yevseyev was asked how the police will react if there is applause on Oktyabrskaya Ploshchad on July, 3rd, Belarus Independence Day. That day there will be two events in Minsk – a parade to celebrate 20th anniversary of independence, and other celebrations. Following numerous arrests of protestors, they had to come up with new tactics. The latest includes no chants or posters. The participants of “Revolution through social networks” just go to the streets every Wednesday, stay silent, and occasionally applaud. But that has still incurred official wrath: thousands gathered on June 22, and there were dozens of arrests. The opposition, however, is staging a “March of the millions” event, where it plans to protest against president Alexander Lukashenko. The Observer has an interesting piece on the anti-politics movement that has taken over Reykjavik city hall. 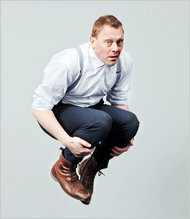 Jón Gnarr the Mayor said he knew nothing of politics apart from the Wire and ruled out from coalition anyone who had not seen all 5 seasons. “We do not owe – we shall not sell – we shall not pay” and “they must all leave now” are now the most popular labels amongst the greek aganaktismenoi – the outraged. These mass rallies, with their openness and the fact that they look different than traditional union or party meetings, have functioned as an outlet for this anger and frustration. The people refuse to be governed in such a manner and the government is unable to govern them. This textbook definition of political crisis is fully manifest in Greece…. for the majority of Greek people party politics is associated with unjust neoliberal policies, media manipulation, corruption and close links to big business and lately an almost servile stance towards international organizations. In light of the above, one can say that this ‘anti-political’ stance is exactly the foundation of an authentic process of radical politicization, the beginning for an alternative politics of collective action, direct democracy and radical social change. That is why on the squares of Greek cities we are witnessing a unique experiment in democracy. Three weeks ago, things changed. A motley multitude of indignant men and women of all ideologies, ages, occupations, including the many unemployed, began occupying Syntygma – the central square of Athens opposite parliament; the area around White Tower in Thessaloniki; and public spaces in other major cities. The daily occupations and rallies, sometimes involving more than 100,000 people, have been peaceful, with the police observing from a distance. Calling themselves the “outraged”, the people have attacked the unjust pauperising of working Greeks, the loss of sovereignty that has turned the country into a neocolonial fiefdom of bankers, and the destruction of democracy. Their common demand is that the corrupt political elites who have ruled the country for some 30 years and brought it to the edge of collapse should go. Political parties and banners are discouraged…. The parallels with the classical Athenian agora, which met a few hundred metres away, are striking. Aspiring speakers are given a number and called to the platform if that number is drawn, a reminder that many office-holders in classical Athens were selected by lots. ..